Does Social Media factor into SEO? There are many diverse opinions on whether Social Media factors into SEO results. Years ago Google denied it, but as of 2018 and many research experiments later, it appears that Social engagement can help with your SEO indirectly and even directly. It’s undeniable that many of your potential site visitors will not only search for you on social media platforms, but these will also end up redirecting visitors to your website. 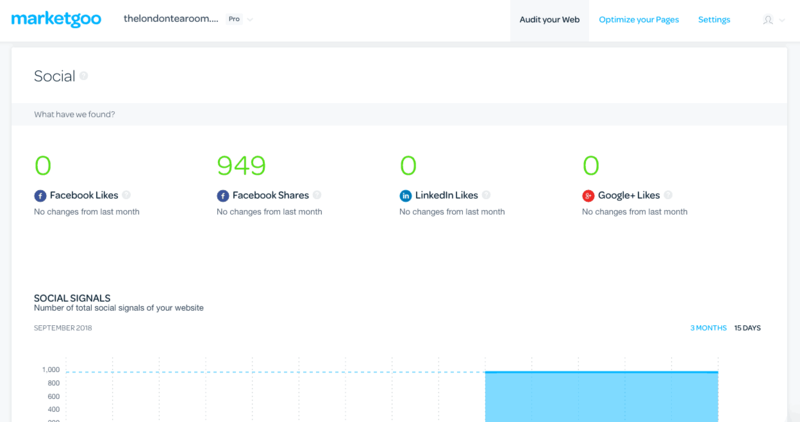 MarketGoo looks at your activity and user engagement on Twitter, Facebook, and Google+, and gives you pointers to improve your social media visibility. You will also be able to see how your competitors are faring on the same channels, allowing you to set a benchmark for your performance and focus on making these channels work for you. In this area, you will establish and optimize your presence on social media. Being present on the most important social channels is just as important as your activity on them. They will help you generate leads, and increase awareness of your brand. It is important that your activity on these channels be frequent, consistent and most of all, high quality. Don’t just post for the sake of posting.